This entry was posted in Comedy, Zombies. Bookmark the permalink. I know. If I had a dime for every time I had to fight off flaming zombies, I’d be rich. That’ll teach me to stay out of the Goth gay bars! Yeah. It tends to get annoying after a while. You know.. With the whole, decapitation and stuff. 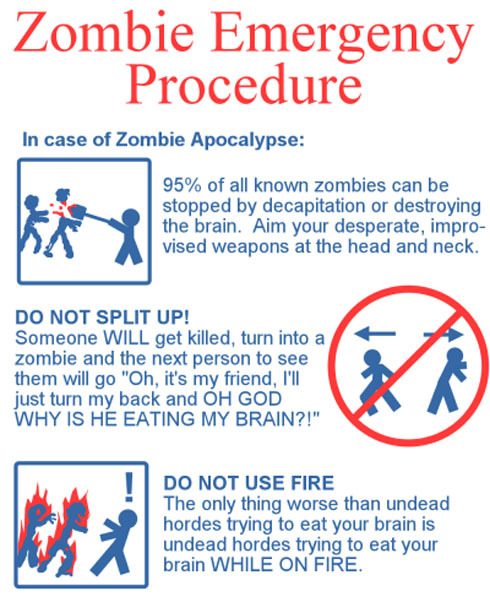 I would recommend reading the Zombie Survival guide Written By Max brooks, it goes through more details about how to survice a zombie attack and what you will need to survive for several years, if not decades.